Thirty years ago the Dodgers were battling the New York Mets for the National League pennant in what was a seven game dogfight. The Dodgers had gone down 2-1 in the series, and entering game four at Shea Stadium, were desperately in need of a win to avoid going down 3-1 in games. On that night, veteran John Tudor, an arm the Dodgers traded Pedro Guerrero for countered New York flame throwing sensation Dwight Gooden. 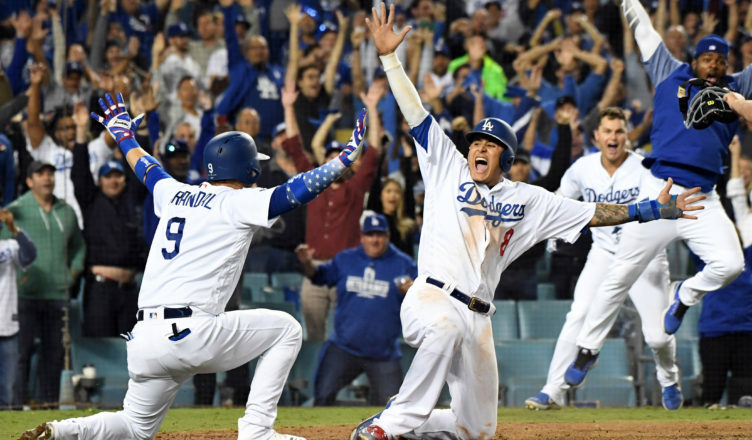 What followed was one of the greatest MLB postseason games in history that ended with the Dodgers winning in 12 innings. On Tuesday night the 2018 Los Angeles Dodgers found themselves in a similar situation. After being shutout in game 3 on Monday night, the Dodgers found themselves in a 2-1 series hole, and an offensive black hole. The boys in blue desperately needed a win to keep their pennant hopes alive. The similarities between the two games are striking. Tudor provided the Dodgers with five innings, while the 2018 Dodger’s starter Rich Hill also went five frames. Neither pitcher was involved in the win, but Tudor allowed four earned runs on eight hits, and Hill allowed just one earned run on three hits. Hill struck out six before surrendering a run in the top of the fifth to tie the score at 1-1. The game would remain tied until the bottom of the thirteenth frame. Like the 1988 NLCS game 4, the 2018 NLCS game 4 had everything. There was great pitching, tense matchups, amazing defensive plays, big hits, and flared tempers. Thirty years ago that NLCS was marred by a suspension to Dodger closer Jay Howell after he was caught with pine tar on his glove. The 2018 NLCS became chippy after Manny Machado clipped Brewer’s first baseman Jesus Aguilar’s leg running out a grounder to first. The 1988 Dodgers were trailing 4-2 in the top of the ninth when John Shelby walked and contact hitting, but not known for power backstop Mike Scioscia drilled a home run into the right field bullpen. The Dodgers and Mets went into extras. In the 2018 NLCS, the Dodgers and Brewers were involved in an extra inning game as well. This game was more of a pitching duel, and there was not a home run hit in this game for once. The Dodgers got an early lead when Brian Dozier’s RBI double in the bottom of the first gave the boys in blue a 1-0 advantage. Milwaukee would tie in the fifth when series villain Orlando Arcia singled and Domingo Santana’s pinch-hit double scored him. Hill was seen throwing a tantrum in the dugout, tossing gum, candy, and whatever else he could get his hands on. Back in 1988, Kirk Gibson would muscle a ball out of the park in the top of the twelfth to give the Dodgers a 5-4 lead. Meanwhile back in 2018, the Dodgers stranding base runner after base runner. They were having trouble making contact as well, striking out seventeen times in the marathon contest. Back in New York, the Dodgers were struggling to retire the Mets in the bottom of the twelfth. Mackey Sasser started the inning with a single to right off of Dodger right hander Tim Leary. Failing to lay down a bunt, Leo Mazzilli followed suit with a single to center. The Mets had runners at first and second with none out and the Dodgers were in trouble. The Shea Stadium crowd came to their feet as their big bats were due up. Meanwhile back in the present day at Dodger Stadium, Julio Urias was pitching a scoreless top of the thirteenth. The Dodger bullpen had turned in eighth shutout innings allowing just five hits, one walk and striking out nine. 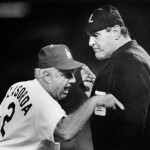 In 1988 Leary got Gregg Jeffries to fly out to left, prompting Tommy Lasorda to make a pitching change. Southpaw Jesse Orosco was brought in to face Keith Hernandez. In 2018 Max Muncy lines out to start the bottom of the thirteenth. Milwaukee hurler Junior Guerra is tossing his fourth inning of relief. The Brewers have little options left in their pen, while the Dodgers have none. Speaking of little options left, Jesse Orosco was the 88’ Dodger’s last reliever available. With the suspension of Howell they were down a pitcher. After Orosco they had nobody left to pitch save for the game 5 starter Tim Belcher. The 2018 Dodgers were mounting a rally. Manny Machado, the man who boasted about not hustling lines a broken bat single into left to give the Dodgers their first base runner since the bottom of the ninth inning. Back in New York, the 88’ Dodgers were clinging to a one-run lead. Orosco walked Hernandez and after falling behind Daryl Strawberry, led to Lasorda running out to the mound to talk to Orosco. “what the hell is wrong with you”? He shouted at the lefty. Whatever he said worked, as Orosco induced Strawberry to pop out. The Dodgers were just one out away, but the bases were still loaded and one of the best hitters for the New York club, Kevin McReynolds was due to bat. Back at Chavez Ravine, Dozier fouls out and the Brewers are one out away from getting out of the inning as well. But with Cody Bellinger at the plate, Guerra uncorked a wild pitch. The ball bounced a few feet from Milwaukee catcher Eric Kratz. That was far enough for Machado to advance to second base. The Dodgers had a runner in scoring position again. The question remained, could they score him? Travel back to 1988, Flushing New York. The Dodgers are one out away from tying the series at two games apiece. But they had run out of pitchers. Orel Hershiser had been seen warming in the Dodger bullpen. Finally Tommy Lasorda made the move that shocked most fans and pundits. He brought in Hershiser to pitch to McReynolds. That risky move paid off as Hershiser got McReynolds to fly out to shallow center to end the game. Hershiser pumped his fist as the Dodgers filed onto the field in celebration while New York, New York played on the stadium speakers. The 2018 Dodgers had a runner at second with two outs in the bottom of the thirteenth inning of their game 4. With the count 2-2 on Bellinger, Guerra whirled around for a pick-off attempt at second. Again the man who never hustles, actually hustled back into second. On a headfirst slide Machado was safe, and the Dodger Stadium faithful breathed a sigh of relief. After a pitch in the dirt brought the count to 3-2, Bellinger smacked a base hit into right field just past the diving glove of Aguilar. Machado ran faster than anybody had ever seen him run in Dodger land, past third base as he dove into home plate, hand extended….SAFE! The umpire yelled, Machado leaped into the air, hugging the on-deck hitter Yasmani Grandal as Dodger Stadium erupted into joy. The Dodgers have tied the series and what a wonderful sport baseball is again. Exhausting game to watch. I got an email from Badger today. He is on a road trip with his wife, visiting relatives and friends and scouting possible places to move to. We have talked a lot these last few weeks about a lot of things, baseball, life, this blog, friends, non friends, and everything in general. He, as I , have both come to realized how much things have changed in sports, life and our country. I guess what has changed the most is us. We both still see the game as it was, not as it is. As close to the same as these games were, 1988 and 2018, I was much more connected to the 88 game. My passion for the Dodgers was at it’s peak. If the Dodgers had lost that game and been down 3-1, I would have no doubt thrown a huge tantrum. If they had lost last night, I would have shrugged my shoulders and said, oh well, they are what I thought they were. I was happy they won. But either way, it is not life or death anymore. I still love the team, I still love the game, but I also dislike the way it is played now. You can draw parallels to both games and see how alike they are, but you can also see how different they are too. The Dodgers were not a power hitting team at all. They struck out in that game 10 times, the Mets, 4. 4 K’s in 12 innings! The Dodgers HR leader that year, Gibson, had 25 HR’s and 76 RBI’s and ended up being the MVP of the league. Different time, different game. To me, and this is my opinion alone, you can agree or not, makes no difference to me, this style of baseball is almost unwatchable. Player after player, and Smoltz commented about it late in the game, they were all going up to the plate, trying to end the game with one swing. The team mentality was gone. They were pressing, taking pitches right down the middle and swinging at pitches they could not possible make solid contact with. Get a runner on, move him over, and get the man in scoring position with 1 out or less. Makes it much easier to score runs. I would be totally shocked if anyone on this team ever bunts someone over. Hill tried and blew it. Nobody else even gave it a shot. I read a tweet on twitter last night that some guy, obviously hoping for a homer, tweeted after Bellinger hit that ball in the hole to left for a single earlier in the game. He said, I do not know what Bellinger did there, but I never want to see a grown man do that again. Well, that’s the mentality of todays fan. Hit the homer, win the game, don’t get on and move runners over. That’s small ball. That is what the game was for years. If guys learn to beat the shift by going the other way, then you won’t see Grandal grounding into a rally killing double play because there won’t be anyone playing in that spot on that side of the diamond. But these players are not thinking that way, and the FO does not really worry about these things, but us older fans do. Very accurate on most levels, IMO. There was that article in which Daniel Murphy spoke about why he’s all about the HR. Friedman is on the record similarly about how defensive positioning, pitching changes and scouting data make “stringing together hits” MUCH harder. It does make the game tough to watch. I (self-important alert) posted earlier about how I think Roberts is a little too short-termist in his changes. Bluto, change, is not always for the better. If the hitters approach changes, the game will morph again. Sometimes what goes around comes around. Difference is something like this, today’s kids big hero’s are guys like Stanton and Judge, my heroes were guys like Pete Rose and Hank Aaron. As great a hitter as he was, Aaron was about both, power and average. He could hit 40 dingers with ease and never hit more than 44 in one season, but he was about the most consistent player you could want. He and Willie Mays, when my heyday was, were the best at that. Ted Williams was about the purest of them all. As for Friedman, he is one of the reasons the games are so unwatchable……he believes in all that stuff, so he stocks the Dodgers with those kinds of players. Not sure your point nor why I was addressed, but I never said change was always for the better, nor did I imply Friedman (or any other highly regarded GM) was a believer in the current baseball trend. Agree with you 100% Freeze and Kemp should have played the whole series based on their stats and the fact that both are vets. The game sure has changed for the worse and Roberts is the bad end of it. Excellent article Scott. Since I watched both games it was like flashback to better days. Badger says hi. Scott. the best article, in my opinion, you have written. You told an interesting story comparing the two games. Reminded me of Vice Scully and his vivid description of the game while listening to only a radio. All I ever needed to appreciate and understand the game. Sorry. Face palm here. Of course I meant Vince Scully.